Good but pretty heavy. I wouldn’t make it again. Rachael Ray, the popular host of 30-Minute Meals and $40 a Day seen daily on the TV Food Network, puts the fun back into entertaining with this exciting collection of recipes, all designed to feed a crowd or smaller gathering in 30 minutes or less. Using her trademark free-hand style of cooking and readily available ingredients, Rachael makes having people over seem effortless. She offers helpful cooking and organizing tips throughout. When it comes to entertaining, Rachael believes that less is more. Keep it simple, and you will enjoy your own party more. Her recipes will make you look way cool. Relaxed weekend brunches, festive cocktail and tailgate parties (couch potatoes welcome, too), informal family celebrations, and dinner parties with delicious seasonal menus and healthy eats are included. Mix and match menus with recipes from around the world keep things interesting and wonderfully flavored. And the best news for Rachael's fans: many of these recipes are being featured on her show, and the most popular are to be found in this collection. 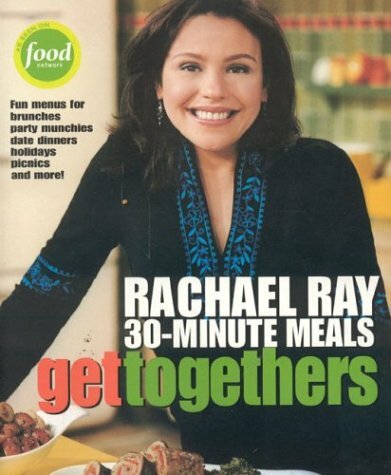 Rachael Ray appears on the TV Food Network as the host of 30-Minute Meals, named one of the best new shows of 2002 by MSN and $49 a Day, a popular travel show. She is the author of the New York Times bestselling 30-Minute Meals, The Open House Cookbook, Comfort Foods, Veggie Meals, and 30-Minute Meals 2, all published by Lake Isle Press, Inc. She lives in Lake Luzerne, New York, near Glens Falls.